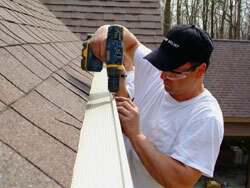 Trust Safeguard Chimney, Roof and Gutter to handle every situation that concerns your chimney. We boast full expertise in chimney cleaning, chimney repairs, chimney liners, chimney dampers, flue cap spark arrestors,and masonry repair so you can definitely rely on us for excellent service. In line with our chimney sweep services, here are some important tips from Safeguard Chimney, Roof and Gutter the professional in chimney care and maintenance. Do not burn trash in a wood stove or fireplace. Do not allow the fire to smolder. Contact Safeguard Chimney, Roof and Gutter to clean your chimney regularly. The key is to burn small, hot fires, using hardwood, such as Oak and Cherry. This will minimize creosote accumulation and maximize heat production. Keep fires burning hot with flames, not smoldering with a lot of smoke. Be careful not to add too much firewood. In a fireplace, keep the flames visible below the fireplace opening. In a woodstove, keep the flames confined to the woodstove itself. With glass doors, keep the doors wide open with the screen closed for a good half an hour after starting the fire. When you see the fire is burning well, close the doors and set any draft controls. It's better to add smaller loads more often than to cram in a lot of wood trying to get an all-day burn. When you're ready to put a fire out, separate the logs by moving them to the side of the fireplace or stand them on the end in the back of the fireplace. Close the screen and/or the glass doors tightly, and close the damper once the fire is completely out. Is your damper open? If it is and the smoking continues, open a nearby window a crack for a minute or two until the fire is going well. Prior to starting the fire warm the chimney by holding a piece of burning rolled-up newspaper in the (opened) damper region for 10-15 seconds. If the chimney, continues to smoke call Safeguard Chimney, Roof and Gutter . Your chimney may be clogged by animal nests or accumulation of creosote or it may have additional problems. The sour, sickly odor is the usual smell of creosote. The solution is to call Safeguard Chimney, Roof and Gutter to safely clean your chimney and install a flue cap/spark arrestor to prevent water from entering and reacting with the creosote. Safeguard Chimney, Roof and Gutter can also recommend a good chimney deodorant to handle any remaining odor which has been absorbed into the masonry.